Some stories seem naturally worth repeating, sometimes as poetry, especially if they can be freshened up with a new perspective or little-known fact. Like gold, the tale is where you find it. Whether it is well known or not, each has its own fascination that keeps the regional history alive. Cow Chip Poetry—Lies, Lingo & Lore! Second edition just released! 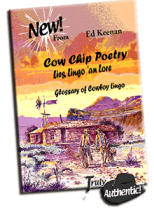 Ed Keenan's new edition of "Cow chip Poetry---Lies, Lingo & Lore" is 207 pages. It contains a total of 57 original cowboy poems, an extensive lingo glossary and many cowboy illustrations. 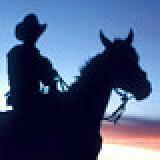 Cowboy poetry and story tellin' date back to the earliest cowboys, the earliest of which were black. 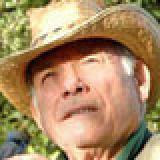 Around the campfire, after chuck, cowhands would naturally talk and brag about themselves, and entertain each other with poems and songs and tall tales known as "windies". They bragged about their exploits and work and would often reminisce about back home, or times past. "Windies" in the form of story tellin', braggin' and tall tales developed in to an art form. (Some hifalutin' folks might question that.) Generally there was an element of humor or drama to their stories. Over time some of these stories were told by means of poetry, the more unbelievable the tale or poem, the more enjoyable. Poetic lines could make a story more interesting and often added another dimension to the humor or drama.